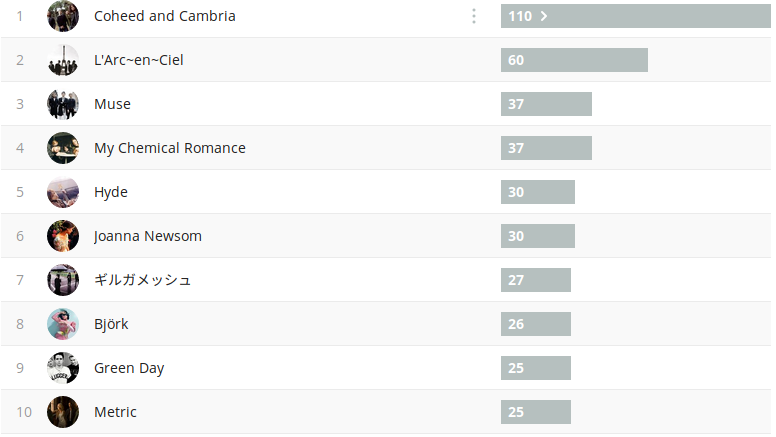 Coheed and Cambria (-) I’m still riding that Coheed and Cambria hype. I’m trying so hard not to be listening to them 24⁄7. I just want to play their new album over an over again! Metric (*) I have been playing a couple of their songs over and over again. They really make me want to jump up and dance! Daughter (*) This is another case of replaying a band over and over again. Youth is such a good song, I always feel it every single time I listen to it. 椎名林檎 (+5) Shiina Ringo came out with a song recently-ish and her catalog is now on Spotify. So I’ve been listening to a lot of her this week. boy pablo (-4) My boy, Pablo, is still a goodie but I feel like i’m listening to too much of him. I only like two of his songs (or more accurately, I’ve only listened to two of his songs). Kero Kero Bonito (*) They released an album the same week that Coheed and Cambria released theirs and I like it a lot! Only Acting is my favourite from the album. I don’t know how to describe it. Like a noisey grunge pop rock? Amy Winehouse (*) I have no idea what triggered my Amy Winehouse resurgence. I loved her a lot back in junior high with her Back to Black album. Childish Gambino (-) Feels Like Summer is still a bop even though we’re well into October. And since I’m doing Sober October this month, Sober is my ironic song of the month. Even though the song title is “Sober” the chorus goes, “I’ll never be sober.” The opposite of what I want but hey, it’s catchy! Green Day (*) Wow, this is a surprise for me. I have no idea where this came from. I don’t remember listening to this much Green Day. I did recently went through their entire catalog on Spotify and saved the songs that I like. I love a lot of their songs. It’s always nostalgic listening to their songs. 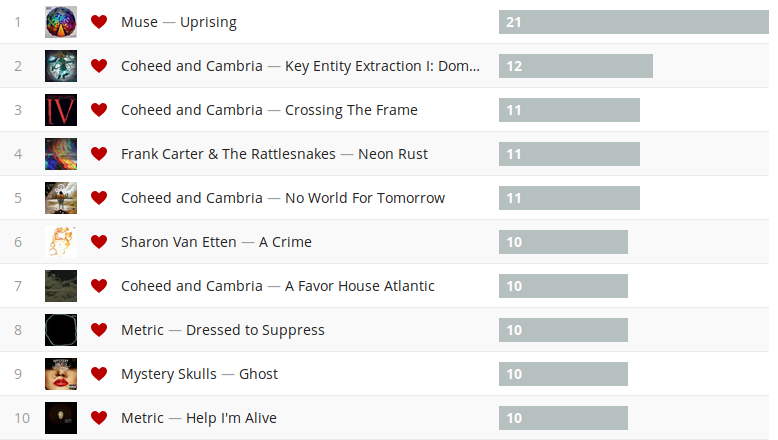 Whatshername and Redundant are two songs I can think of listening to this week. So good. Joji (-7) Ahhh, Joji. SLOW DANCING IN THE DARK is getting a little too melancholy for me. It’s a good song though. I need to check out some of his other songs. There’s this one song I do like but it’s not on Spotify. Joji sampled and remixed a song and it’s pretty good. 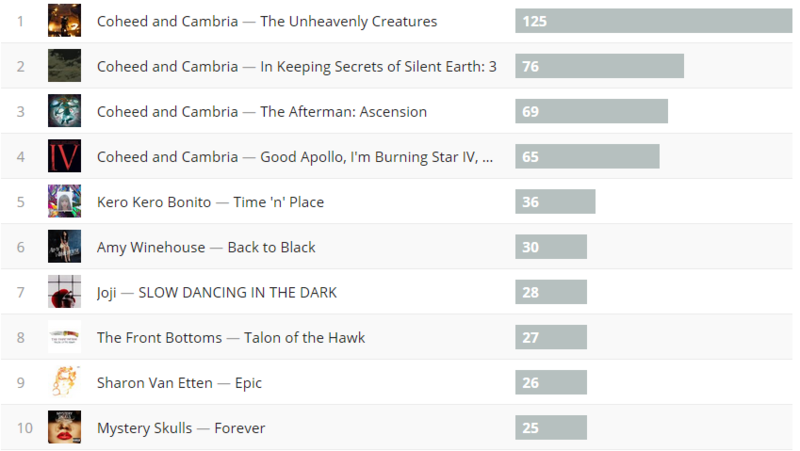 Coheed and Cambria — Vaxis I: The Unheavenly Creatures (-) This week Coheed is a little less dominating. But I still have been listening to a lot of them. I just can’t keep my hands off Vaxis: I.
Coheed and Cambria — In Keeping Secrets of Silent Earth: 3 (+1) This album is slowly growing on me. It really is a huge epic. I need to take a couple more playthroughs with this. Coheed and Cambria — The Afterman: Ascension (+1) Nostalgia is really hitting me hard with this. I say this a lot but Ascension is definitely one of my top albums of all time. It’s just so good. Coheed and Cambria — Good Apollo, I’m Burning Star IV: I (-2) I don’t want to wear out Good Apollo I too much. This album is another nostalgic classic. Kero Kero Bonito — Time ‘n’ Place (*) They released this album the same week Coheed released Vaxis I and I love it! Amy Winehouse — Back to Black (*) Really the only Amy Winehouse album that I’ve listened to. I need to get a proper listen though. I’m really only familiar with the singles and Me and Mr. Jones. Joji — SLOW DANCING IN THE DARK (*) This is just a single. I’m kinda looking forward to the album? YEAH RIGHT was a little iffy but I’m optimistic for the rest of the album. The Front Bottoms — Talon of the Hawk (*) One of my friends introduced me to this band and I really like them unironically. The vocalist has such a weird voice that I don’t think is that good but it adds character. It’s really folksy and it works for this band. Sharon Van Etten — Epic (*) Oh man, why didn’t I find about Sharon Van Etten earlier? Epic is a heartbreaking album. It details an abusive relationship Etten went through and her lyricism is just so beautifully tragic. I love her. Mystery Skulls — Forever (*) This band came up on my Discovery Weekly playlist, if I recall correctly. Forever is a decent album but there are a couple of standouts. One of my friends showed me the music video for Ghost and it’s great. They recently came out with another music video and my favourite song from the album, Every Note is featured for like thirty seconds on it. Kero Kero Bonito — Only Acting (*) I thought I was only acting but I felt exactly like it was all for real. This song is so fun! I love it. I love the noisey grunge and the glitchy 80’s/90’s aesthetic. 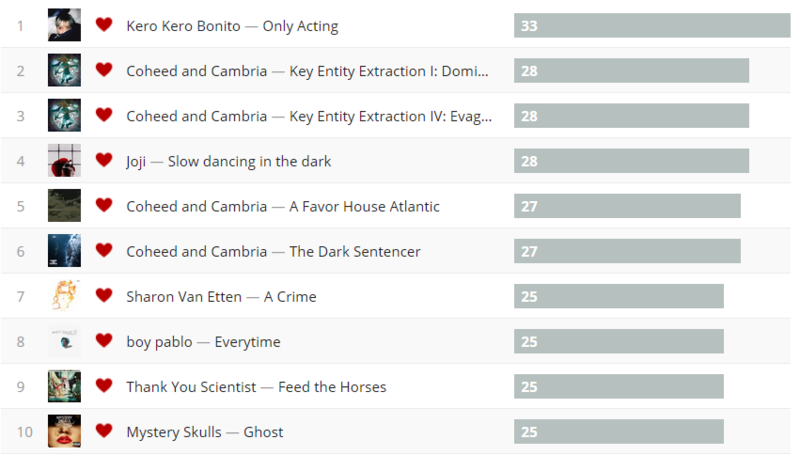 Coheed and Cambria — Domino the Destitute (*) Definitely one of Coheed’s best songs. I’m so surprised they don’t play it more often in their shows. It’s just so… Hard hitting. I get chills up my spine when I listen to it. Coheed and Cambria — Evagria the Faithful (*) I’ve spoken about Evagria before but I love this song. It’s groovy and funky and haunting. They really nailed the prog elements in this song. Joji — SLOW DANCING IN THE DARK (*) A small part of me is a little weirded out at how depressing Joji’s songs are. Who hurt you Joji, who hurt you? But it makes for good songs. Coheed and Cambria — A Favour House Atlantic (*) This is a poppy bop and a fun one to listen to live. Good eye, sniper. Now I shoot, you run! 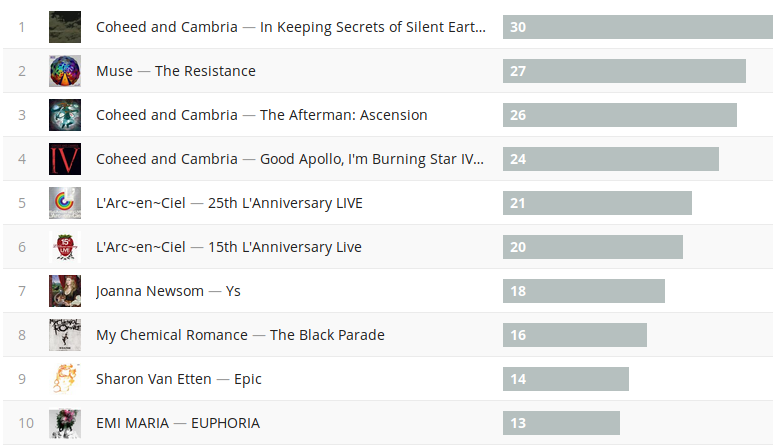 Coheed and Cambria — The Dark Sentencer (-3) This song is slowly wearing out for me. But it’s a good opener to a great album and a good head banger. Sharon Van Etten — A Crime (*) To say the things I want to say to you would be a crime/To admit I’m still in love with you after all this time/I’d rather let you touch my arm until you die. Ahhh. Sharon Van Etten! Who hurt you?? It’s such a beautiful and painful song. I love it. boy pablo — Everytime (*) The song that started it all for these boys. It’s really mellow. Thank you Scientist — Feed the Horses (*) This band is on the record label that the frontman of Coheed and Cambria founded. They are so proggy, I enjoy it. They have a lot of jazz elements which is pretty cool. Mystery Skulls — Ghost (*) Such. A. Bop. I want to sing along to it all the time. When I’m in the office and this comes on, I definitely start mouthing the lyrics. 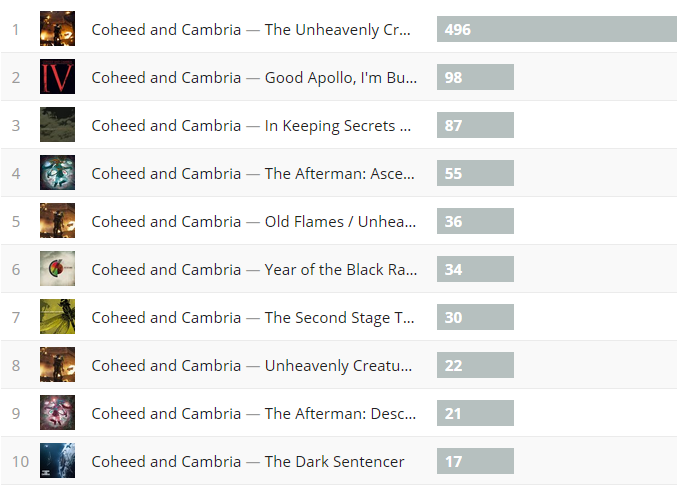 It’s no surprise that Coheed and Cambria has been pretty much all that I’ve been listening to. With their album Vaxis I: The Unheavenly Creatures coming out and seeing them live in concert, I’ve just been falling in love with them all over again. 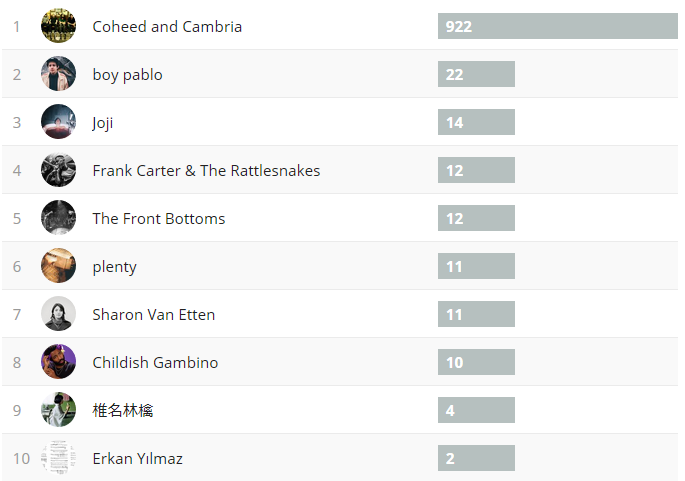 The other artists in my top ten I’ve been listening to a lot as well. Erkan is a person I’ve met on Last.fm and he composes his own music. It’s highly experimental and really intriguing. I do enjoy checking his works out. They’re not very melodic and I put emphasis on experimental aspect. 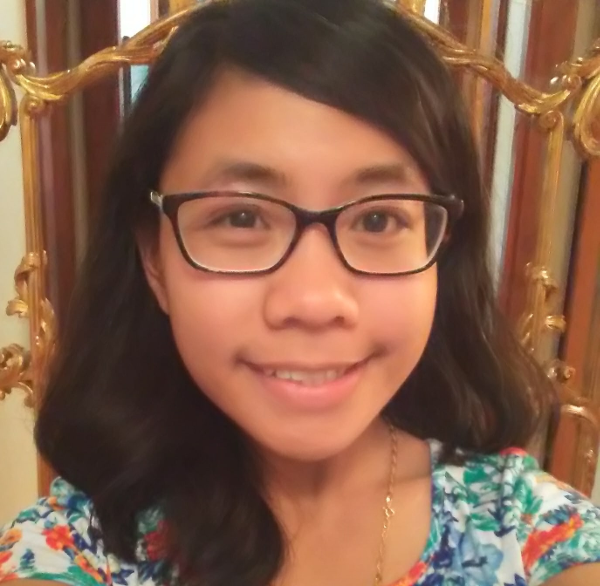 It’s definitely something different. Wow, who knew? 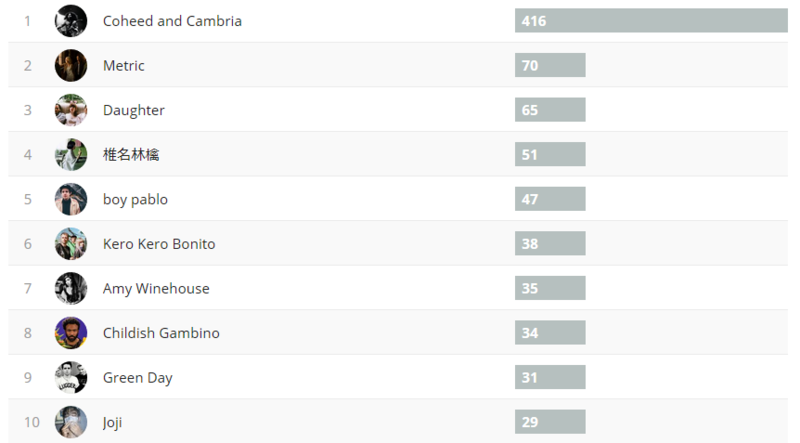 Listening to Coheed and Cambria means that most of my top albums for this week is also Coheed and Cambria! I have been listening to Vaxis I on literal repeat. It is such a good album. The Gutter just might be song of the year. I am in love with it. I am currently fighting the urge to not put it on right now. 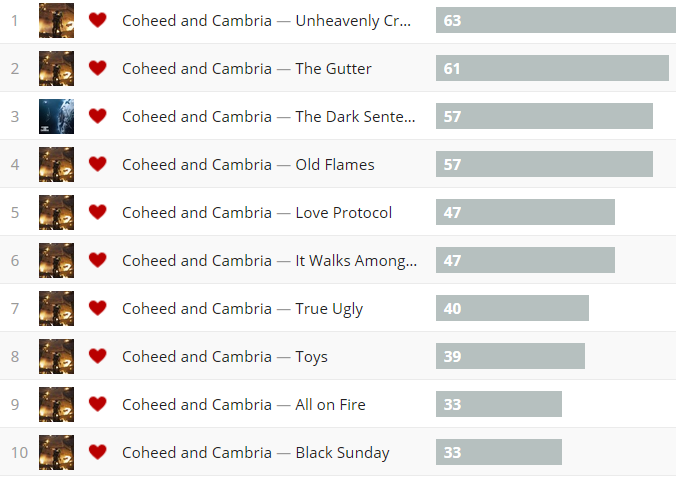 In fact, I asked one of my friends to recommend me some music because I just can’t continue to listening Coheed and Cambria almost exclusively.